Summer. Beach. Music festival. Well that sounds swell. Sign me up. Actually, I am going to a beach music festival & I'm pretty psyched because the California summer days shall soon come to an end. The typical summer music festival will soon change to a fall fest. I've never been to a festival where music & water combine. But what does someone wear to such a function? Imagine a waterfront resort with live music, local grub, & art. Ah, heaven indeed. Alright. 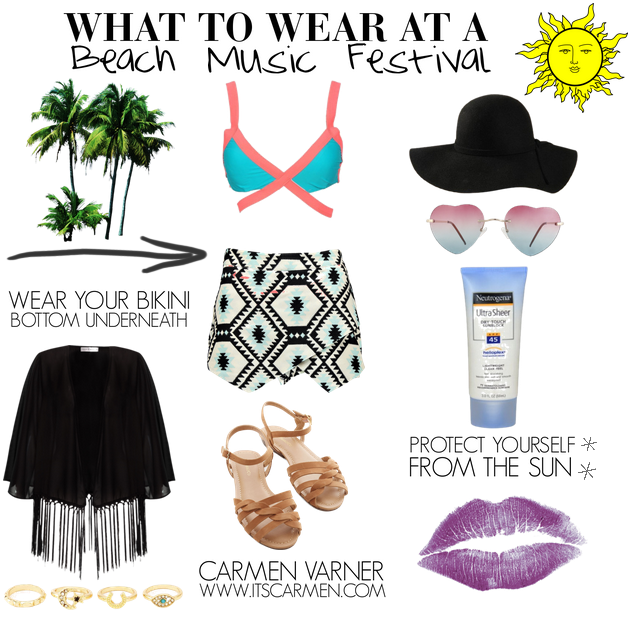 So what to wear at a beach music festival? I've got some answers for you. There's a few things to keep in mind. Due to the delightful California sun, it will be pretty sunny. Due to the beachfront bash, it may be windy, especially at night. 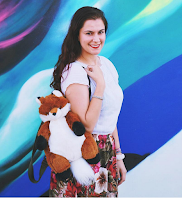 Due to the hours, you'll want to be comfortable enough to move, frolic, & walk. Sun - Hey it's a nice California day. The sun will be beating down on you. You definitely want to protect yourself from the sun. Lather on your sunscreen with a decent SPF. Bring some darling sunglasses to keep your eyes sheltered. And obviously, you can't go wrong with a chic, black floppy hat. Wear your bikini under a geometric skort, so you can head in the water if you want. Hey, throw on some fab purple lipstick. Because, why not? Wind - There's one thing I know about life: expect the unexpected. Despite the obvious summer heat, it still has a tendency to get cool come night time. The beach can often be chillier than other places due to its waterfront nature. I'd recommend bringing a lightweight kimono to layer with your look. Since you're wearing a righteous bikini & rad skort, you'll want to have another garment to add once the sun sets or the wind picks up. Time - You'll be at the beach music festival for several hours. You'll want to be comfortable enough to last. I suggest sandals. They are flat shoes that you can stand in for hours at a time, but you can take them off to take a dip in the beach. I love the neutral color of these strappy sandals. They are versatile & can go with almost any outfit. That skirt is amazing! Love these selections, so spot on! That's such a cute skirt, loving the pattern and colors! O that kimono is so cool! I also love the skirt! Loved your picks! Music festivals are amazing, the atmosphere is the best and you can wear your favourite summer clothes! SPF is probably the most important accessory for being outside at a music festival so I'm so glad to see you included it. Also, I really like the sunglasses that you chose here---ombre AND heart-shaped? Two trends in one! I can't wait until that season starts here! Lovely collage. I like the addition of palm trees, very necessary! Love that bikini top! Great festival outfit picks. I hope you have a fun time, a festival on the beach sounds so cool. I would say perfect choice! Your pics are fabulous! I love the bikini top so much. That tribal print skirt & floppy hat is perfect for a beach fest! I love it! Great selections! I love that bikini top. This is a perfect outfit for a festival! Will be going to a music festival myself pretty soon!